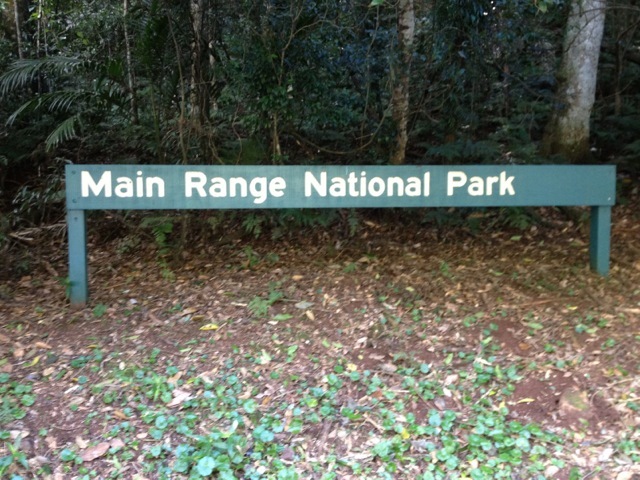 The Main Range National Park is a section of South East Queensland’s Scenic Rim – a quarter circle of mountains attributed to the prehistoric Tweed volcano that existed here over 23 million years ago. 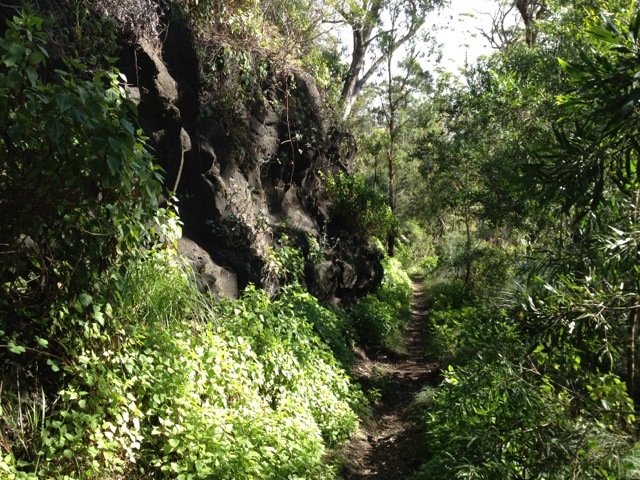 The Main Range is about 115km inland from Brisbane and has plentiful walking tracks along its length. This last weekend, while passing through the Main Range, I had a free morning so stopped at Cunningham’s Gap – the location where Cunningham Highway cuts through the mountains. 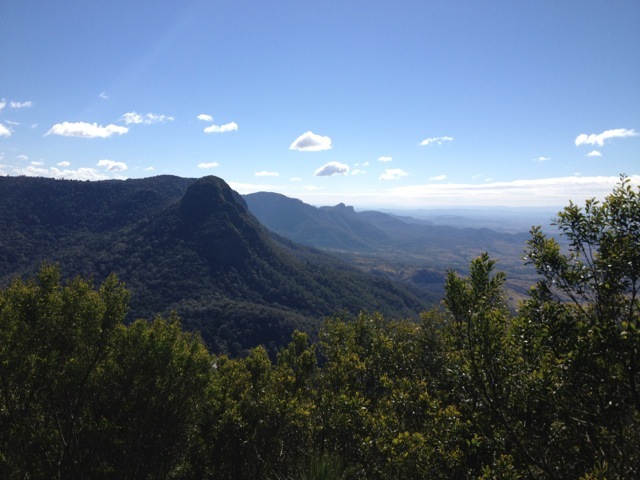 Cunningham’s Gap is the starting point of several well-defined and more casual walks. 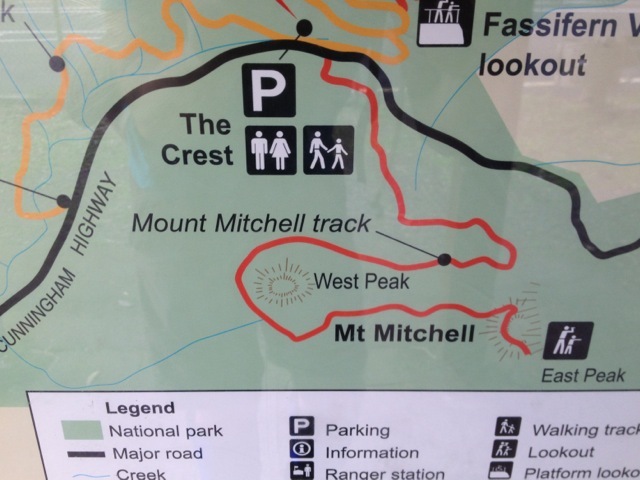 The Major Mitchell Peaks is a 10.2km, 3.5 hour walk, perfect for the time I had. The beginning of the trail starts opposite the car park and meanders its way up the side of the mountain along a forest path. The closeness of the forest gives the illusion that the trail is fairly flat, but it’s not. It’s only the last few hundred metres that the trail begins to climb more steeply, with steps cut into the rock. 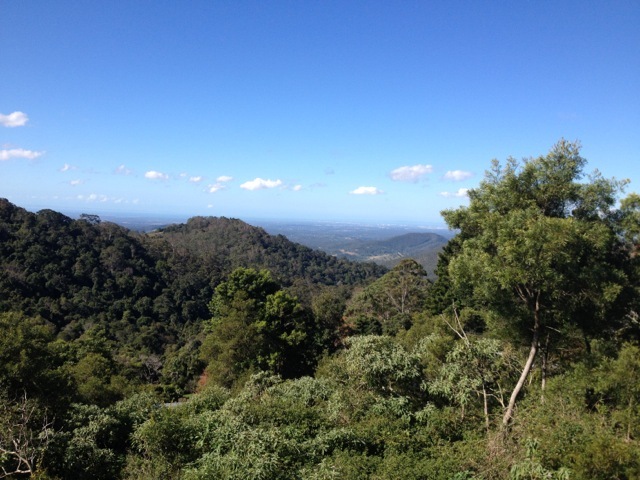 The views to the east are fantastic with the road winding through the forest. Lake Moogera can be seen between Mt Greville on the right and Mt Edwards. To the north, Mt Cordeaux. The trail heads back into the forest as it rounds the Western peak and emerges at the top of the Eastern peak, a short pinnacle of rock that’s been paved to prevent further erosion. I basked in the winter sunshine eating lunch with views in both directions. I would have stayed longer but the occasional icy gust quickly chilled me. The return walk passed quickly and the tranquillity of the trail was broken by the harsh sounds of trucks going past on the Cunningham Highway. On reaching the highway, I returned to my car and continued on my trip. 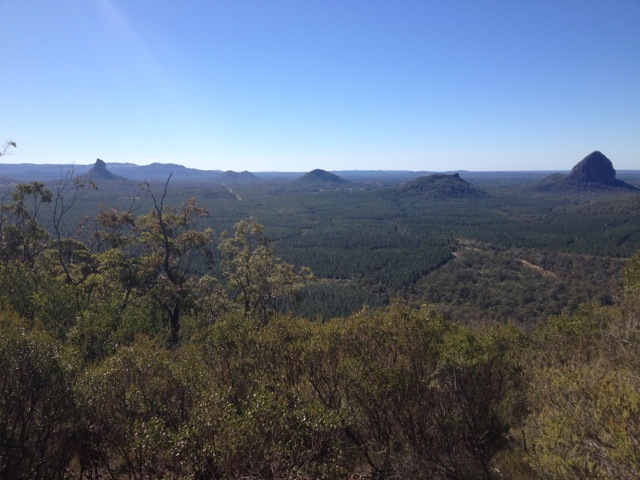 Glass House Mountains National Park – again. 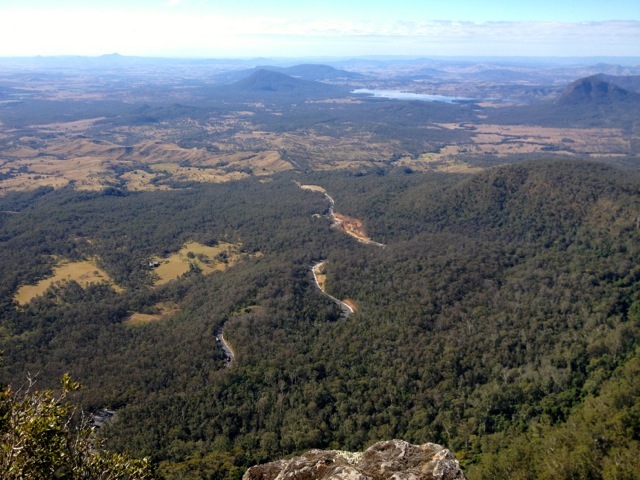 After spending 3 days wandering the trail of the Glass House Mountains, I’m back to climb one that doesn’t have one. 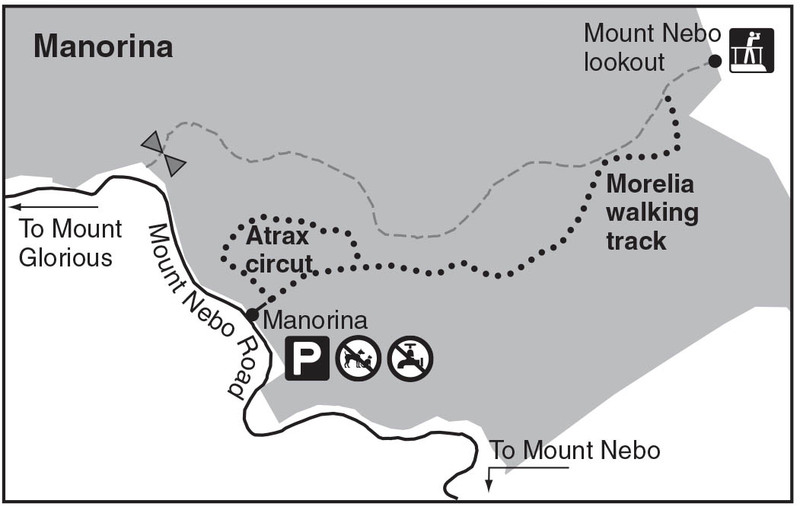 This time I’m walking with my hiking group and the mountain is Mount Tunbubudla East, a 300m tall, off track climb and is rated hard, mainly due to it being trackless. Getting to the mountain is a mission in of itself. The old ‘major road’ that it’s off is actually a boggy dirt road and is untraversable without an off-road vehicle. We parked at the entrance and as a group walked about a kilometre to the muddy starting point. We waited for others to arrive and find us before we headed off into the untracked grass at the base of the mountain. I led the way, pushing a path through the long grass for the others to follow. At the beginning there was a vague track, but this soon disappeared. 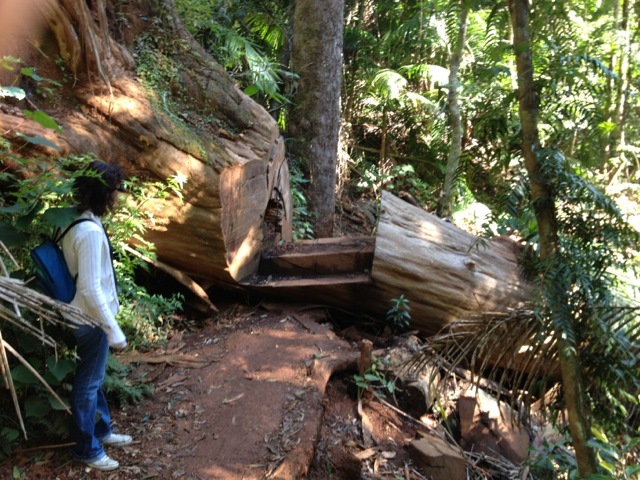 The initial portion of the climb was up tree laden, broken ground. With no track, I had to evaluate each step and find suitable gaps between tree branches. The climb became steeper before flattening out the higher we got, but because of the thick tree cover we were unable to see the views. As we approached the top we came to a large rocky area which did allow us a better view, north across the other Glass House Mountains. We reached the top and sat for lunch at the rocky cairn. I surveyed the route leading towards the West peak but found it too steep to descend. Alone it would have been fine, but with a large group in tow I made the call to return the way we’d come. This disappointed some, as the climbing down in that direction would have led to the climbing of the smaller, steeper twin. The climb down held the same issues as the climb up – a lack of trail – and it’s also harder to see where you’re putting your feet. I again led, picking our way down the side of the mountain. We arrived at the base in short order and walked across the needle covered grass until we reached the muddy road. We could have climbed the other peak, but the mutual decision was not to. A kilometre later we were at the cars and headed off for a well-deserved beer at the Beerwah Hotel. 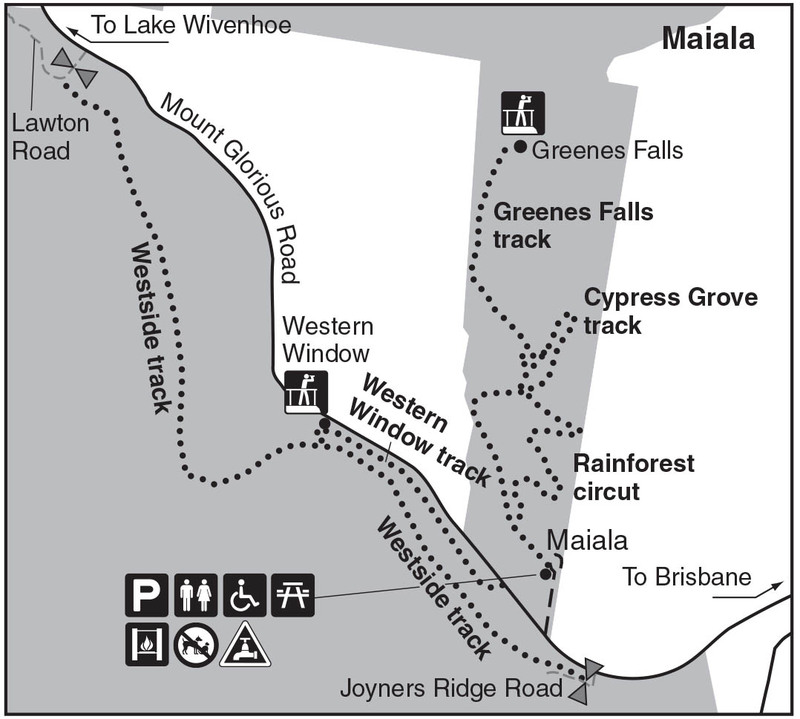 Rainforest Circuit, Cypress Grove and Greenes Falls. Maps on this page are owned by and used with courtesy of Queensland Government. 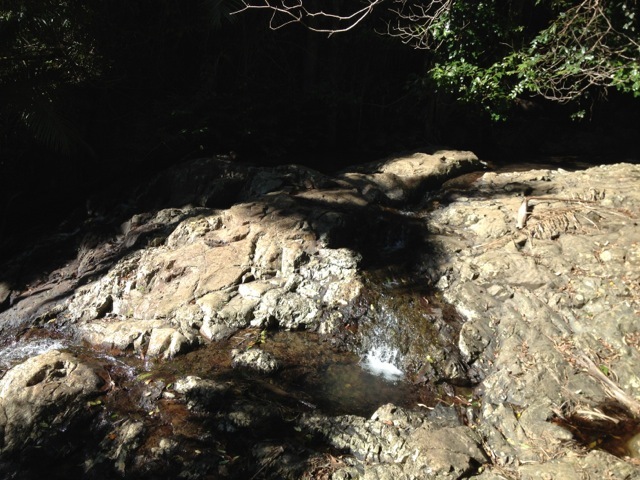 Please visit that site for more detailed information on hiking in this region. 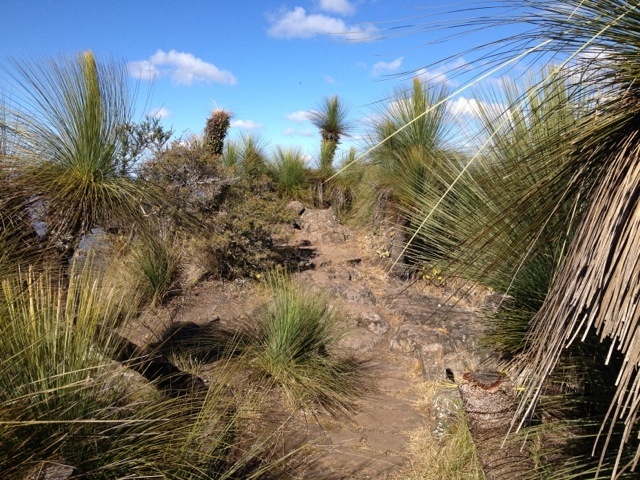 While I much prefer harder and rockier walks, there were several walks in the D’aguilar National Park that I had on my list to do. D’aguilar National Park is mainly forest, so it’s trees, trees, trees, and the tracks are well-defined and not terribly difficult. 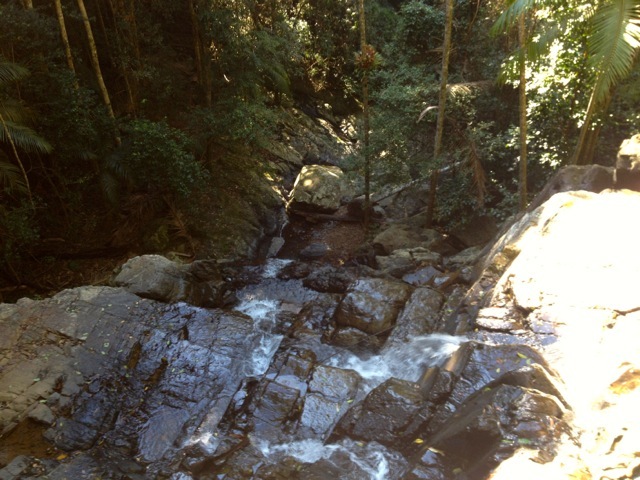 To cross them off my list, I headed out with a friend to the Mt Glorious section and walked into the rainforest. 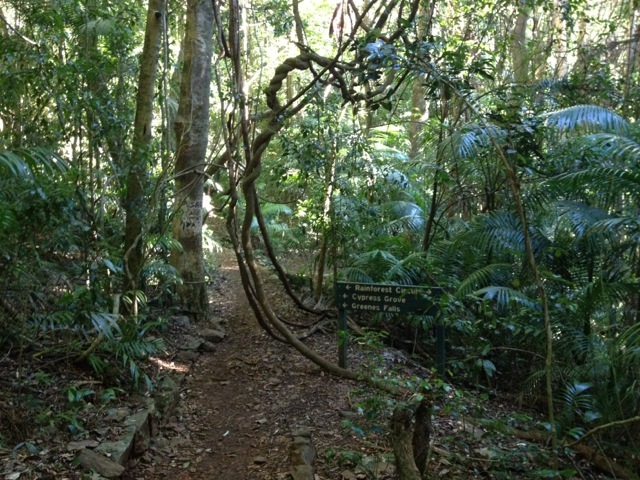 It was an entertaining walk in the cool morning air, with large strangler figs in many places. The Rainforest Circuit and Cypress Groves were fairly standard fare. 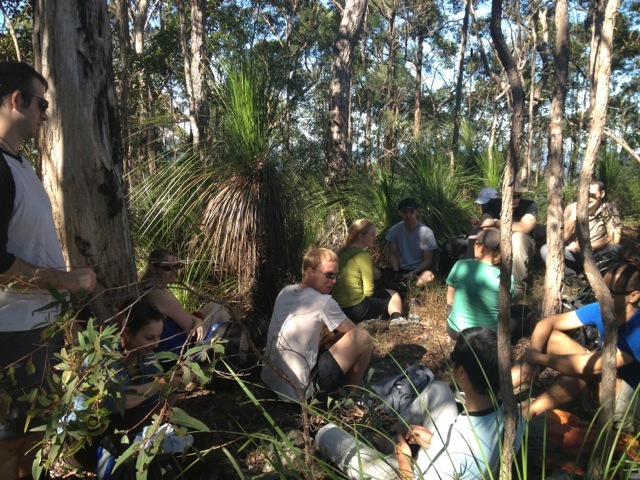 Greenes Falls was a great place for a sit down and a chat. The falls are fenced off, but this didn’t stop me from climbing the fence and rock hopping down to the edge of the falls. 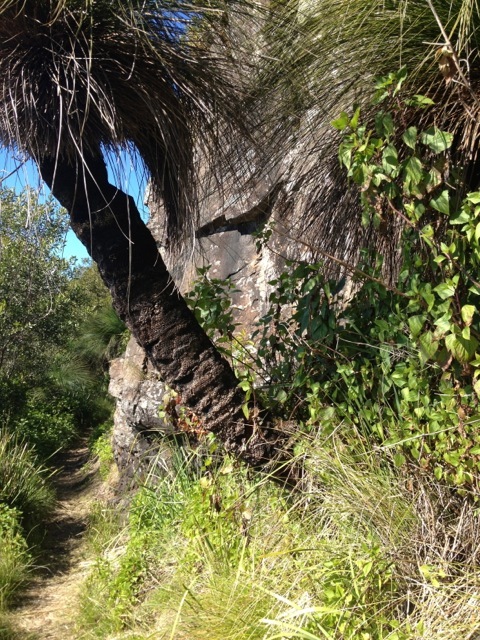 Across the road from the Cypress Grove walks is another tree laden walk along the side of a steeply sloping cliff. 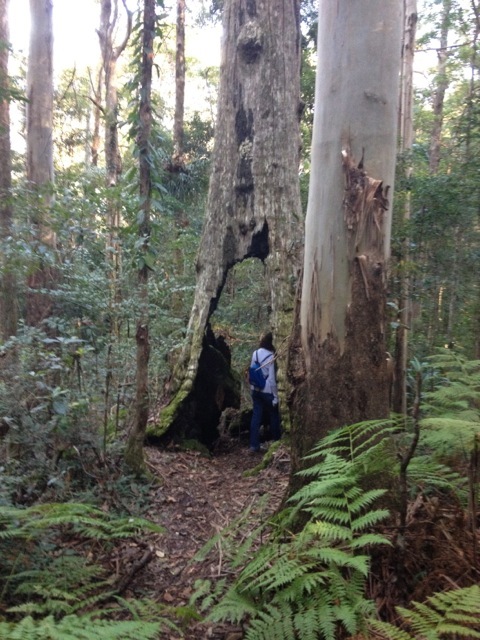 Another slow meander through the forest, climbing fallen giant eucalypts and walking through great burnt out trunks. The trail eventually led to the Mount Nebo lookout, and while there is only a limited viewing area, Moreton Bay is visible in the distance. 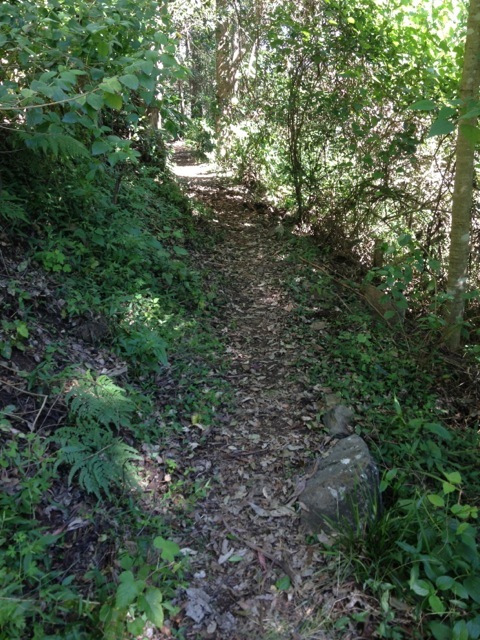 Overall, the trails in the D’aguilar National Park aren’t very taxing, but if you enjoy walking in the woods, this is a good place to spend a few hours on a warm sunday afternoon.